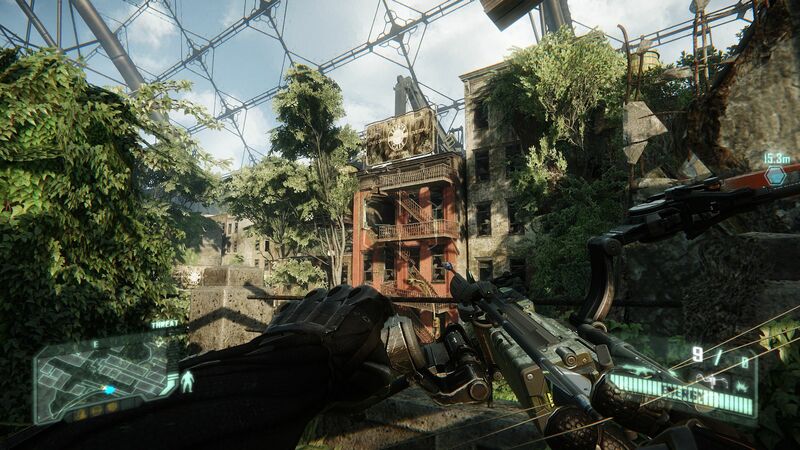 Avant-garde After gamers had a somewhat disappointing experience with Crysis 2, Crytek pulled out all the stops for their new FPS. 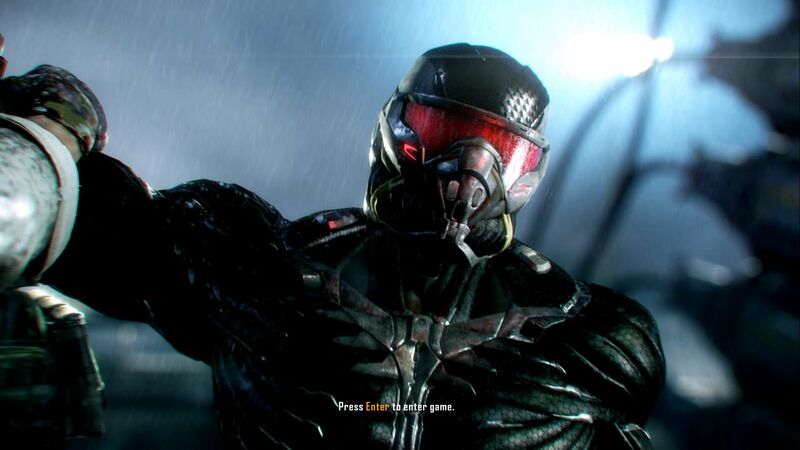 The third title in the series is supposed to present a perfect mix of the first two parts, offering a full Crysis experience. 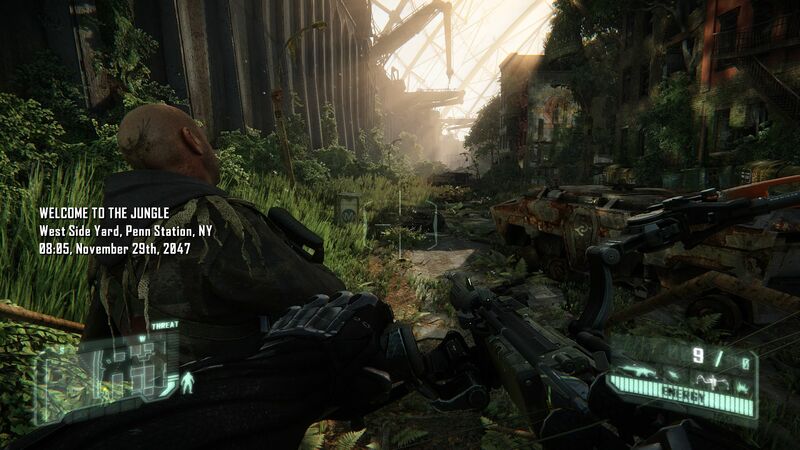 Find out here if Crysis 3 is more than just a graphical showpiece and how much the game will demand from a notebook's hardware. 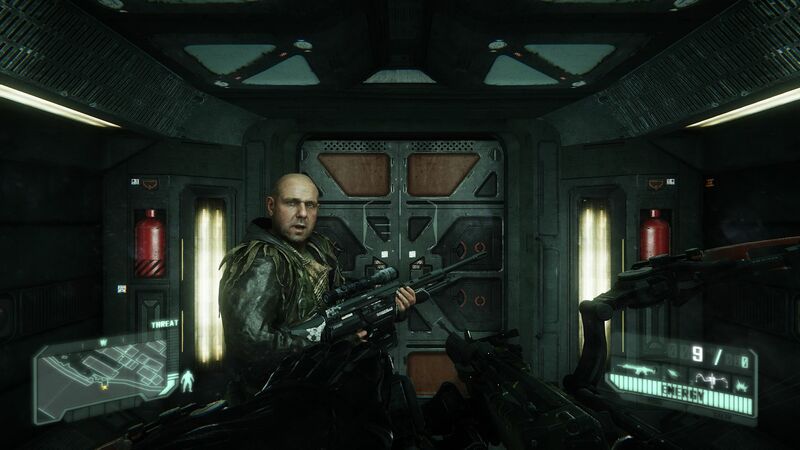 This first 5-10 minutes of Crysis 3 simultaneously reveal one of the game's greatest strengths and one of its greatest weaknesses: The great production quality and the lame, primitive storyline. The main character, Prophet, is freed by his colleague Psycho to fight against the Ceph aliens and the C.E.L.L. 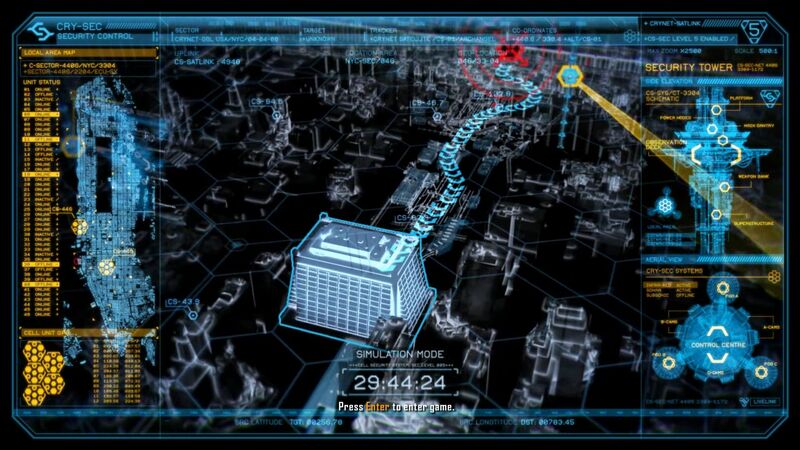 corporation's soldiers in New York. The missions are introduced with cool video snippets, but it quickly becomes clear that the basic story is so banal that many gamers will ignore it entirely. Additionally, most of the supporting characters are flat, and you never really end up caring about them. But as far as critical comments go, that's about the end of the list. In most categories the ego-shooter makes a good or even a very good impression. Alongside the first-class production value (more on that later), we were delighted with the diverse and detailed levels full of atmosphere. 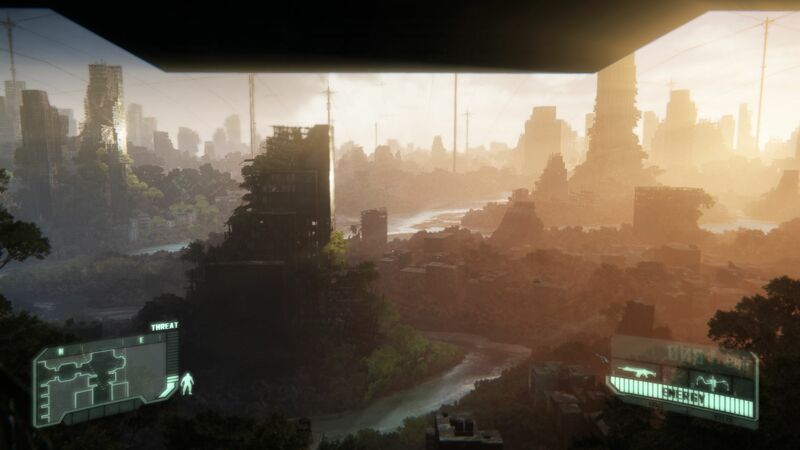 For instance, in the first chapter you fight through indoor and outdoor areas of a rainy port facility, and in the second you make your way through an idyllic green metropolis. 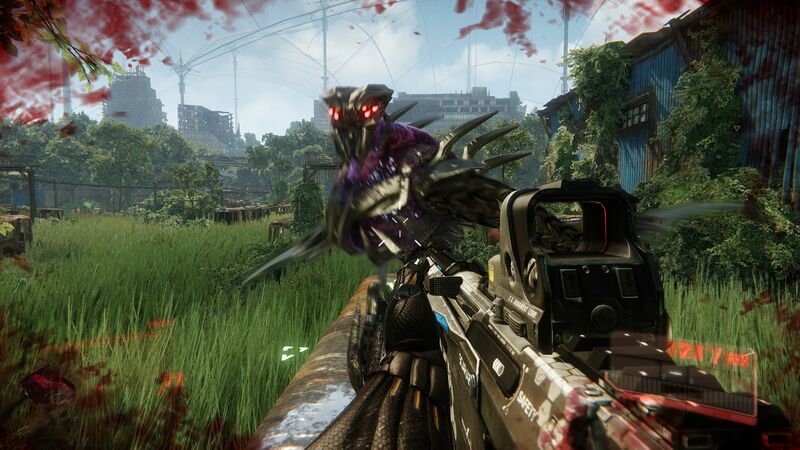 The lush vegetation is reminiscent of Crysis 1, and thanks to the thick grass, it also opens up lots of possibilities for the player. ...and presents the game controls. The circular menu is like that of its predecessor. 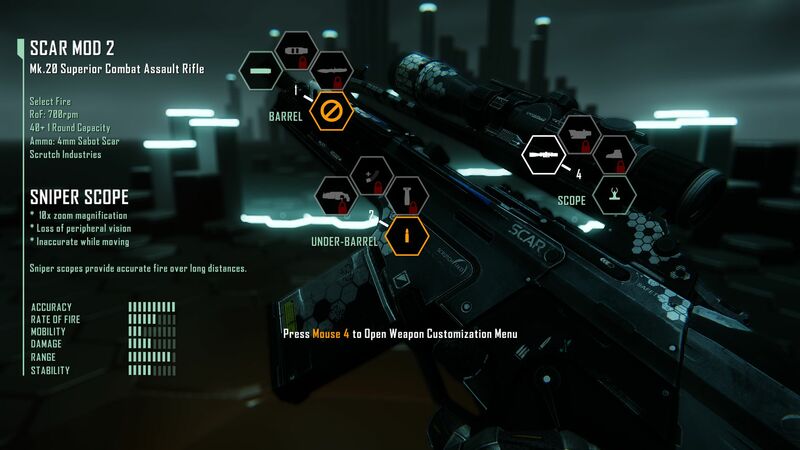 The various weapons can be individualized. Turrets are hacked through mini games. 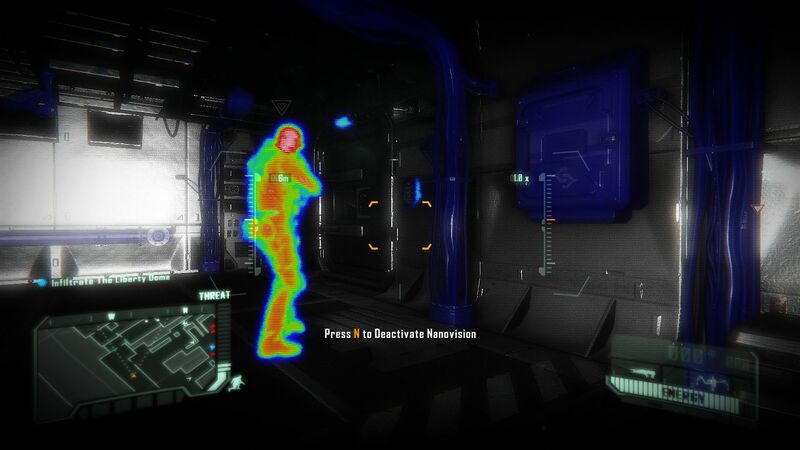 The nanovision is like a thermal imaging camera. For those who want to get through the game as stealthily as possible, the stylistic bow-and-arrow is the perfect weapon in every circumstance - at least against human opponents. 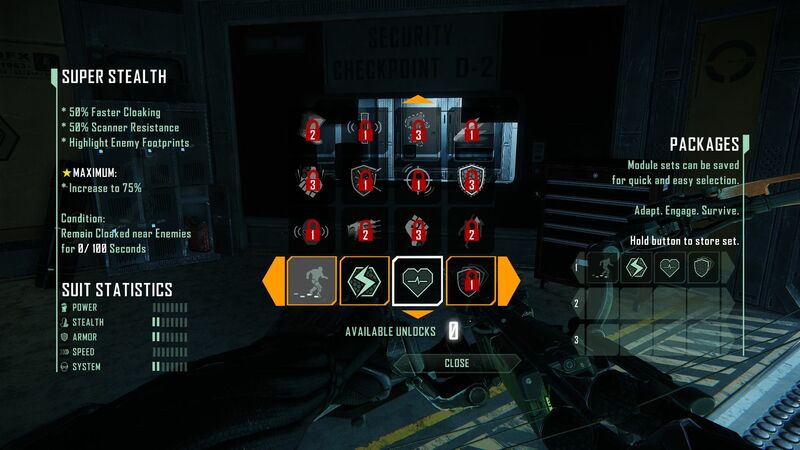 Like the rest of the weapons, the quiet and deadly instrument (it doesn't blow your cover) can be customized in the menu. 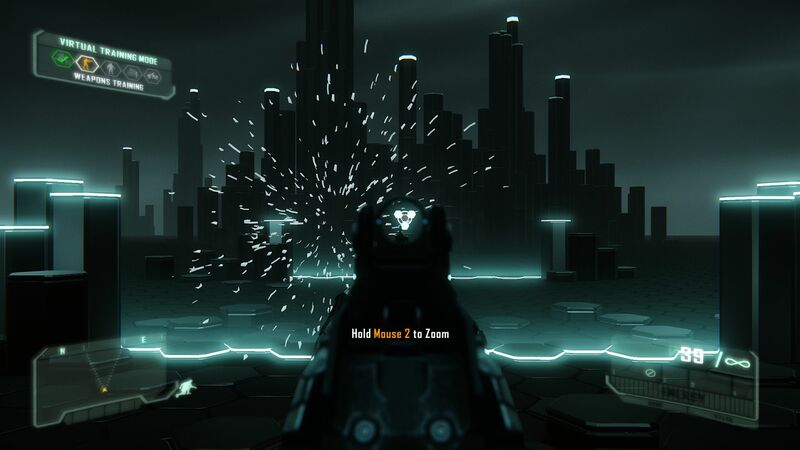 Through the menu the player can choose the shot-speed and the type of ammunition, among other things. 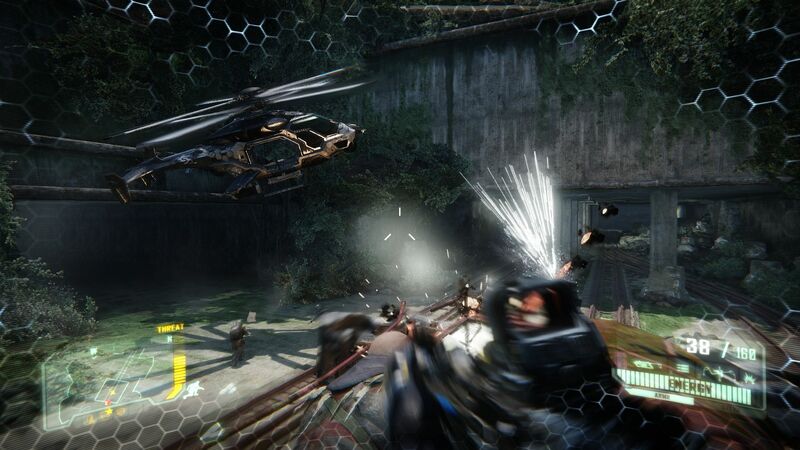 Depending on the situation, Crysis 3 is in large part a game of strategy. 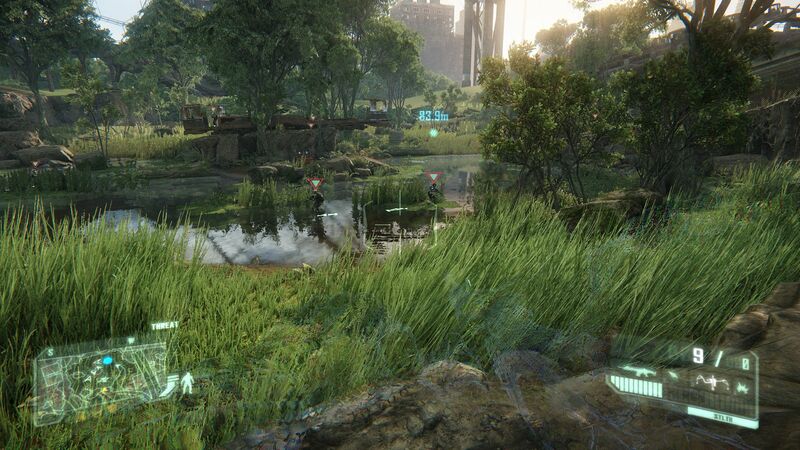 Various enemies are lingering near each other in the water? That's an ideal moment to use an electric arrow! 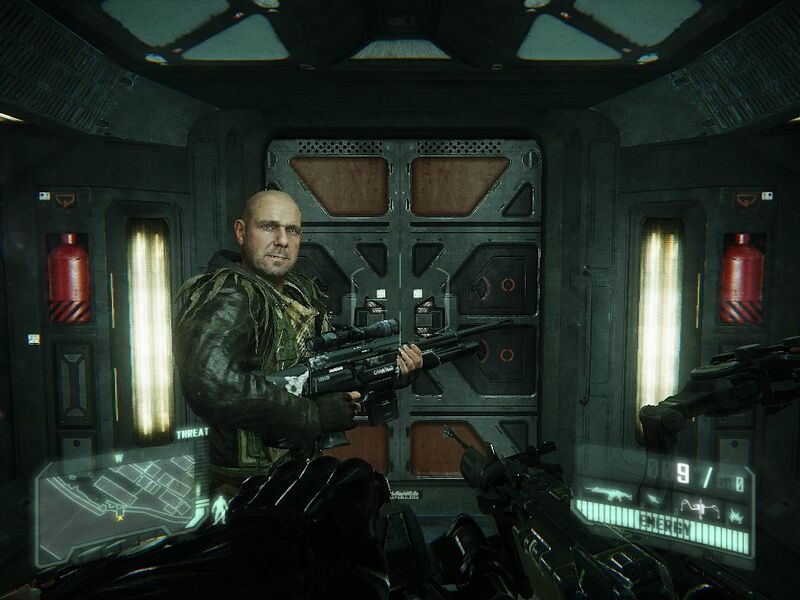 Some of the best improvements Crytek made when it comes to "normal" fire arms are the target visuals and new additions, like a sound damper and a magazine expansion. Speaking of improvements: To breathe a little role-play into Crysis 3, Crytek has built in a nice skill system. The gamer can unlock new abilities with points he or she collects (like a longer sprint time, higher health regeneration, etc.) and save in three different sets. ...and use nice camera perspectives. The player isn't always alone on the journey. The weather effects are first-rate. Even with all the possibilities, it's still easy to control the game by hand. With a simple keystroke you can either activate the armor-mode (standard Q) or the stealth-mode (standard E). 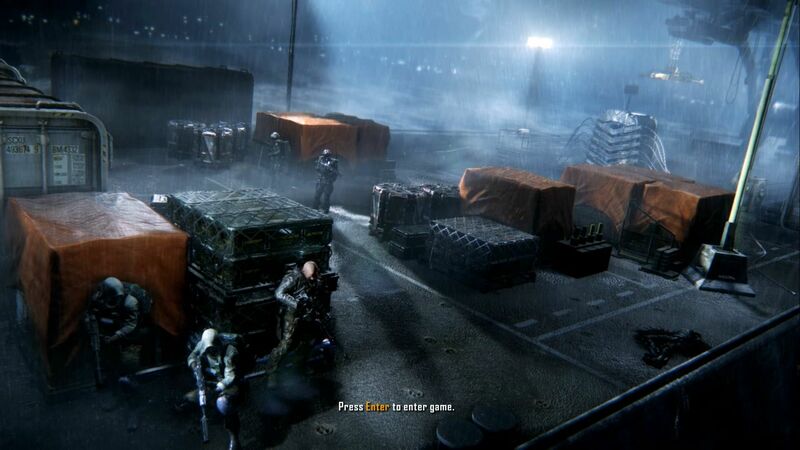 In our experience, the stealth system can certainly hold its own in comparison to other titles. 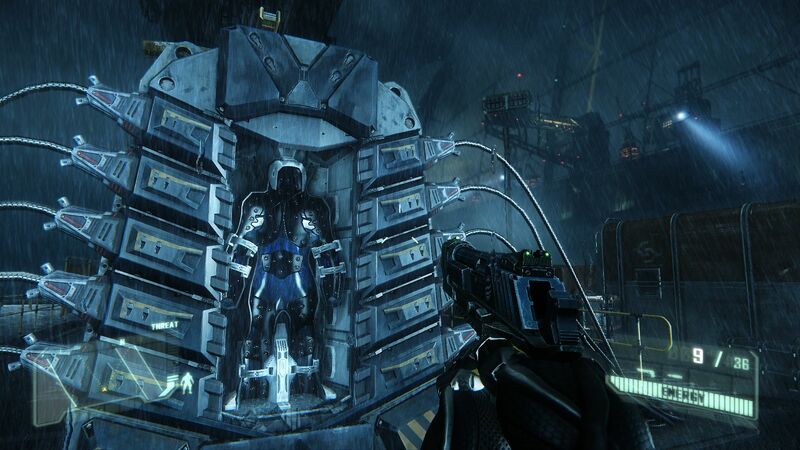 Although Crysis 3 doesn't do stealth quite as well as classic stealth adventures like Thief, Splinter Cell or Dishonored, sneaking around quietly is still lots of fun as there are countless different covering options on the various levels. 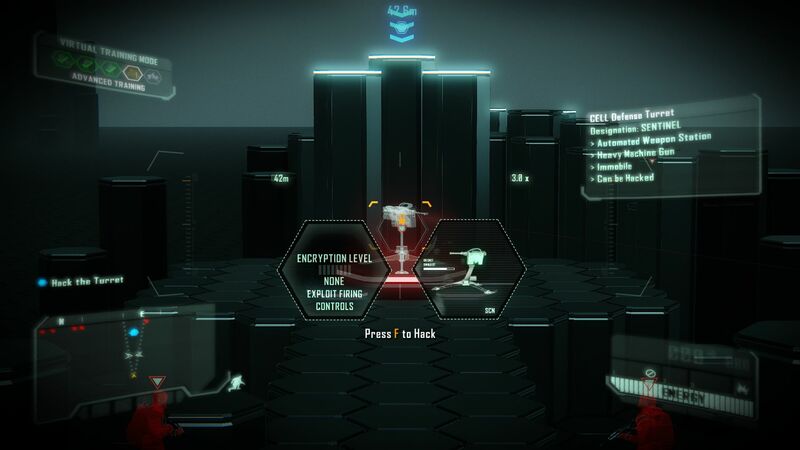 We deem the AI of the enemy mercenaries - aside from the occasional malfunctions - above average, although you shouldn't expect wonderful things. The enemies move around under cover, throw grenades, agree on strategies or even try to flank us every once in a while. 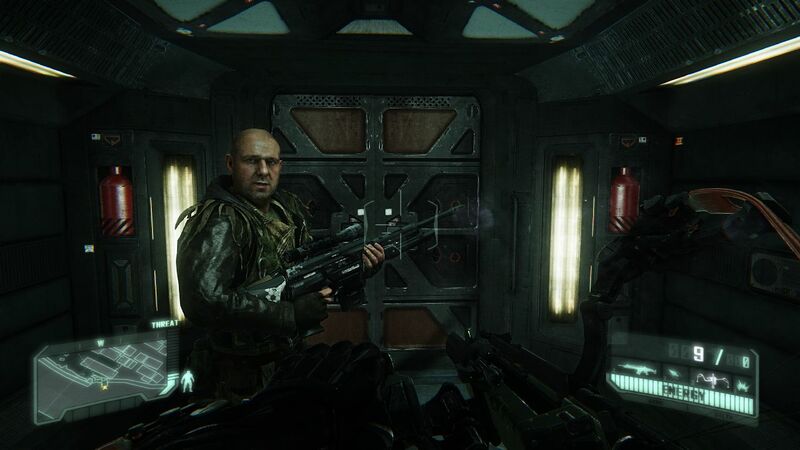 Battles with the alien brutes often turn into simple endurance-shooting ala Call of Duty: Black Ops 2 or Medal of Honor: Warfighter. You can mark opponents with the help a visor. The smoke effects look terrific. 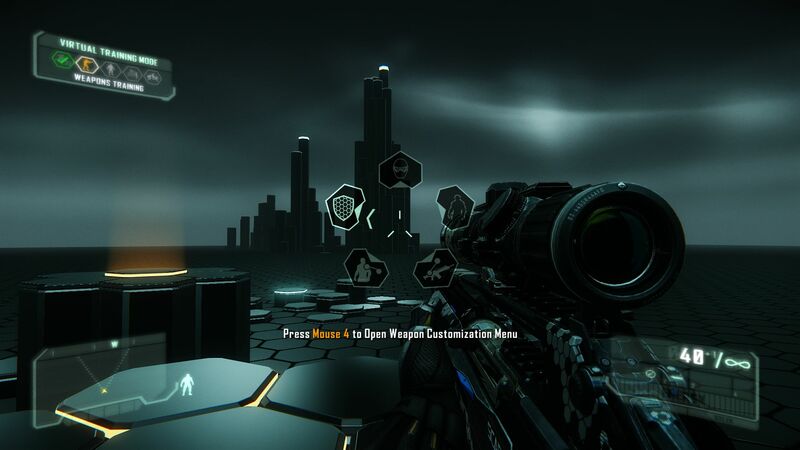 Crysis 3 wins points with its neat level architecture. Some passages are pretty linear. The cool mission descriptions prove to be rather trivial. You can create practical sets in the skill menu. All-in-all, the game mechanics make a good (though not stellar) impression. In terms of sound, we don't have any complaints at all. 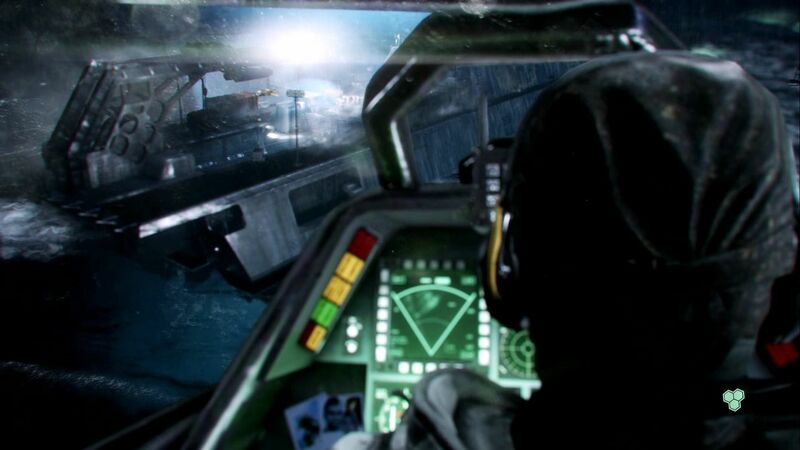 The loud weapon noises are as well done as the game's soundtrack. Level size, however, is an area people could disagree on. 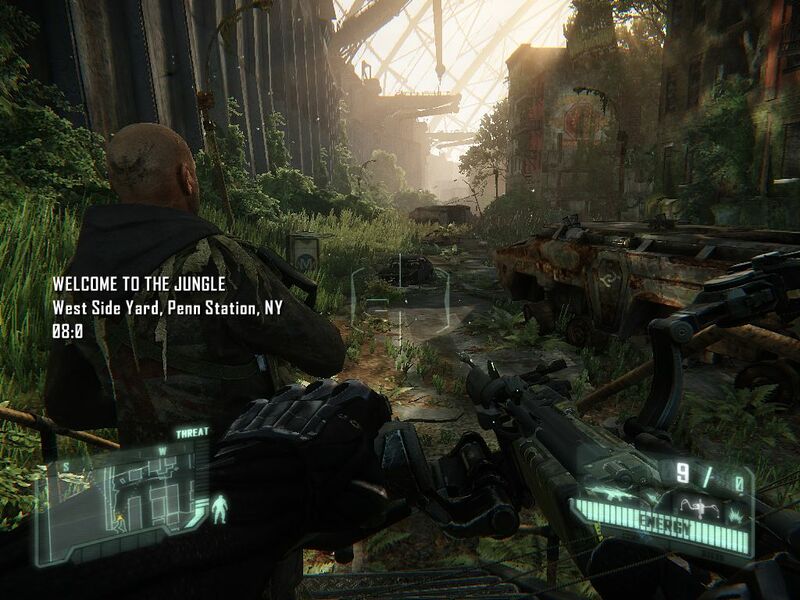 While fans of the first part of the series will find Crysis 3 too "cramped," we think the mixture of wide-open outdoor spaces and more linear inside passages is fairly well balanced. The panoramic views are often intoxicating. Unlike bodies, faces are amazingly well animated. 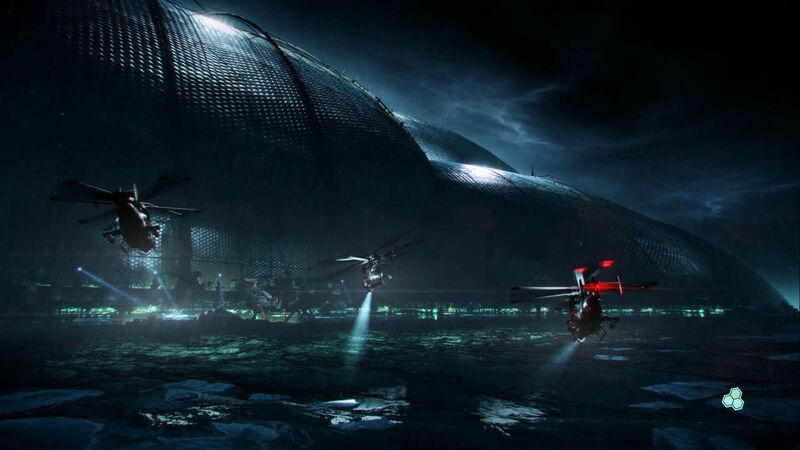 The lighting effects make for a picturesque atmosphere. 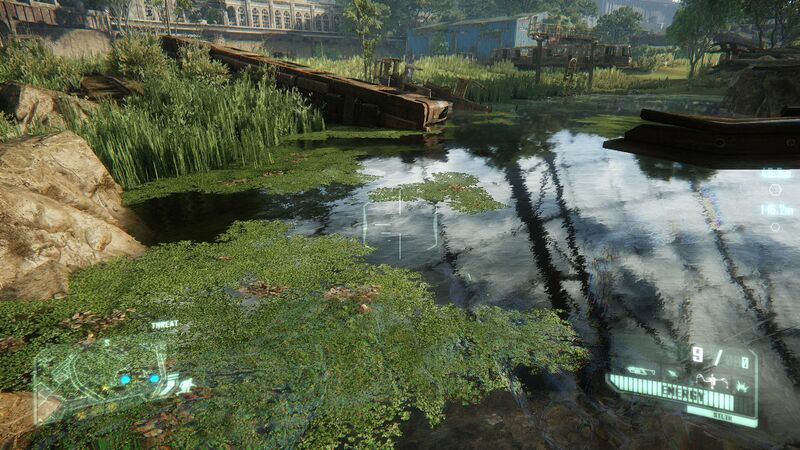 Careful: In Crysis 3 there are mine fields here and there. In terms of atmosphere, there's little to criticize. The outdoor areas are magnificently detailed. In terms of production value, the developers have certainly outdone themselves. Whether we're talking about textures, effects (smoke, particles, weather, etc. 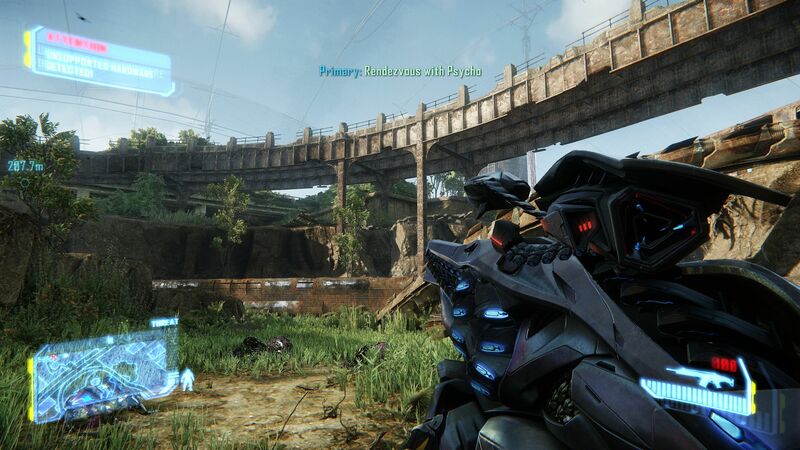 ), lighting, shadows or physics: Crysis 3 is definitely playing in the top league and will have very few competitors in 2013 that can approach the same level of detail. We were especially impressed with the vividly conceptualized outdoor areas, which wowed us with their breadth of vision and great water effects. Only when it comes to animation were we a little more ambivalent. While the body movement feels a little "awkward" and "rough around the edges" (Call of Duty and Battlefield 3 do a little better here), the facial animations are almost at the level of L.A. Noire's (which, in this author's opinion, were magnificent). 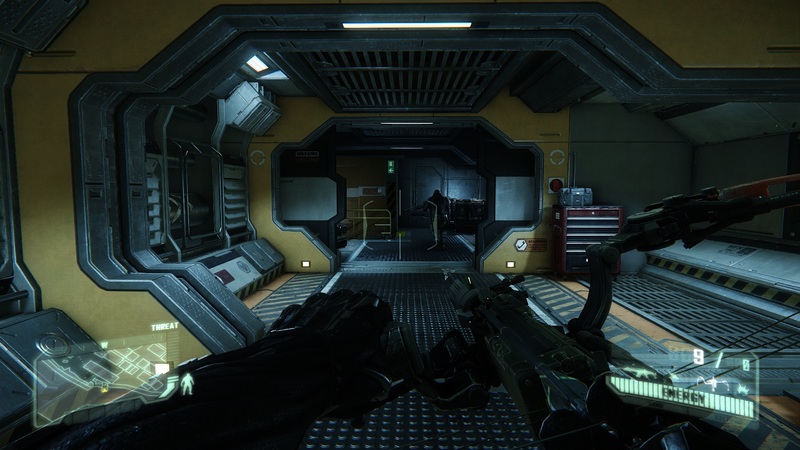 Users should note that since Crysis 3 requires a DirectX 11 graphics card, Windows XP users and owners of DirectX 9 or DirectX 10 GPUs (that includes the popular Intel HD Graphics 3000) are left out in the cold. 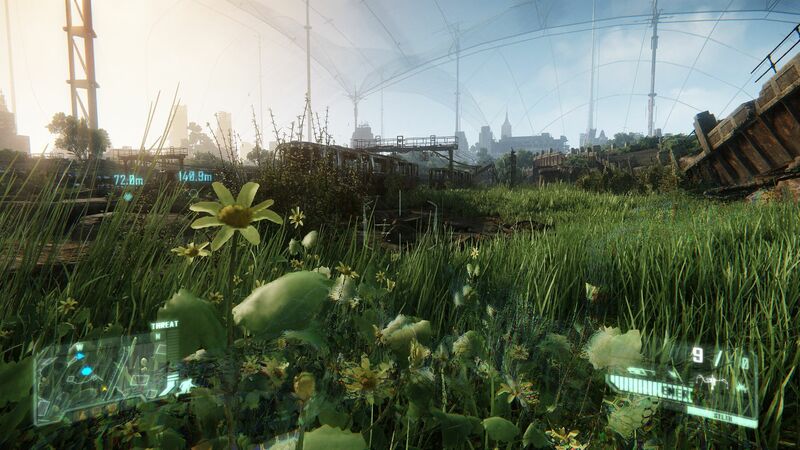 This will be one of the most beautiful games of 2013. The textures are sharp up-close too. In some levels you even discover animals. We especially liked the water imaging. Water + enemies + electric arrow = Schadenfreude. While taking strides delicate ripples develop. 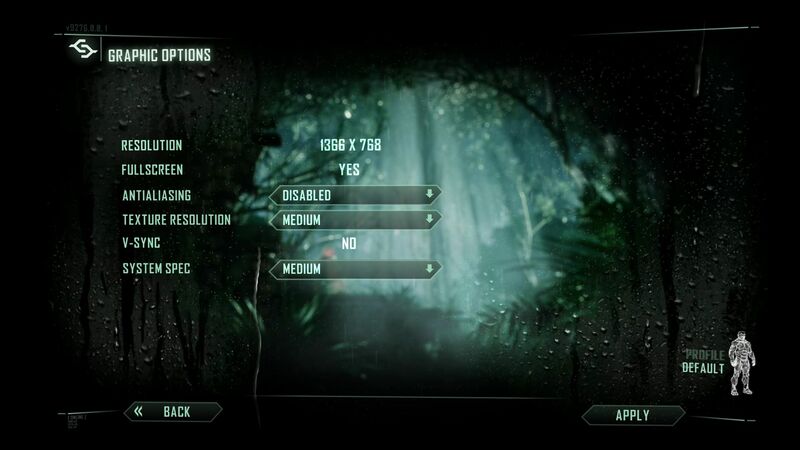 Crytek splits the graphics options (which are found directly within the game) into two menus. In the "Graphics Options" menu you can control the resolution, picture mode, vertical synchronization, texture sharpness, anti-aliasing (the palette ranges from FXAA and SMAA to TXAA and MSAA) and the general quality level ("System Spec"), which automatically regulates the detail settings in the "Advanced Graphics Options". 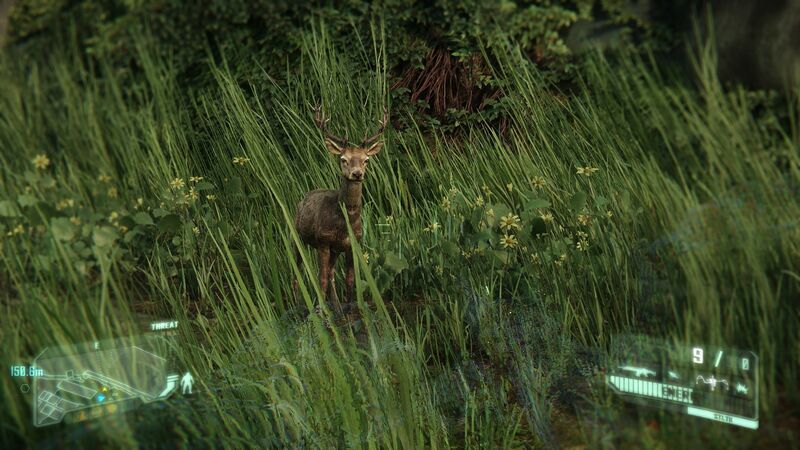 Only the anisotropic filtering (1x-16x), the intensity of the motion blur and the so-called "lens flare" remain untouched by the four presets "Low", "Medium", "High", and "Very High". 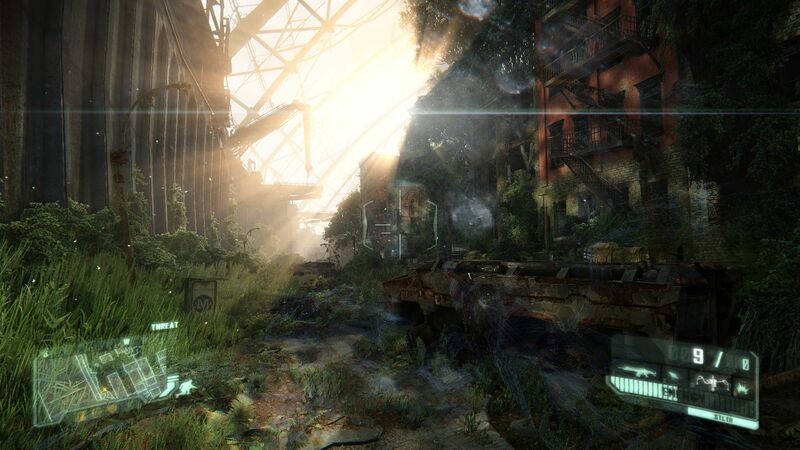 A shame: In order to apply certain settings, Crysis 3 needs to be completely restarted. The load times could also be a little shorter. Even with an SSD it takes a while before the fully-loaded level appears. 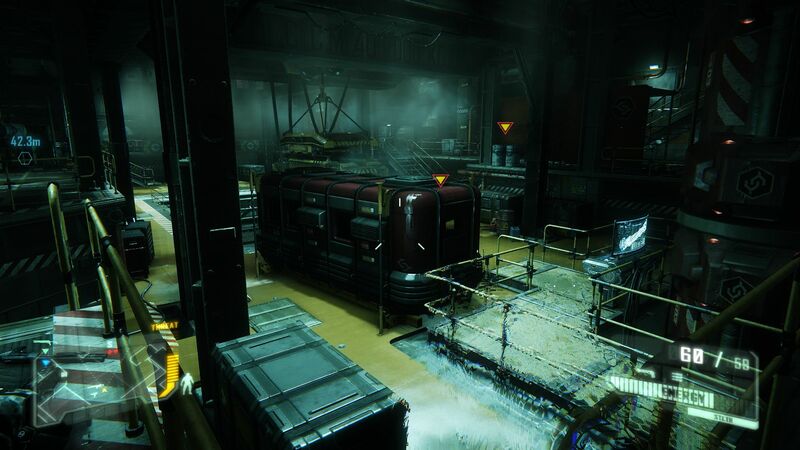 We picked a very demanding scene from the beginning of the first level ("Post-Human") for our benchmarks. As the video below illustrates, we follow the colleague Psycho for about 50 seconds. 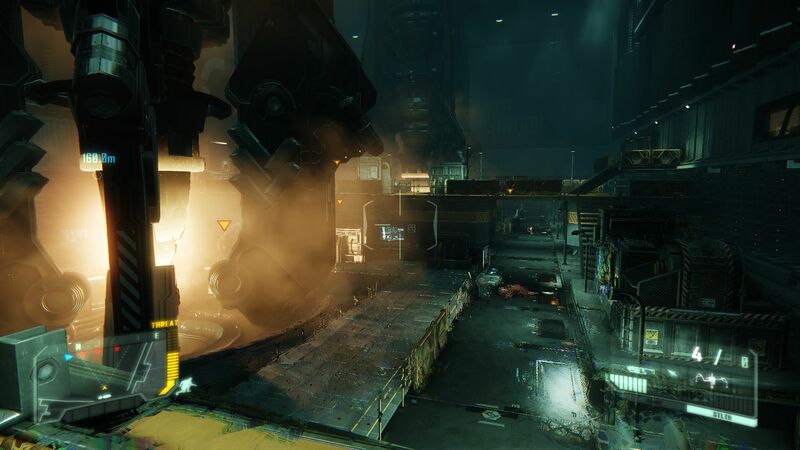 Since the refresh rate is rather low in comparison to other levels, about 25-30 FPS will suffice for the sequence and the rest of the game for an enjoyable experience. 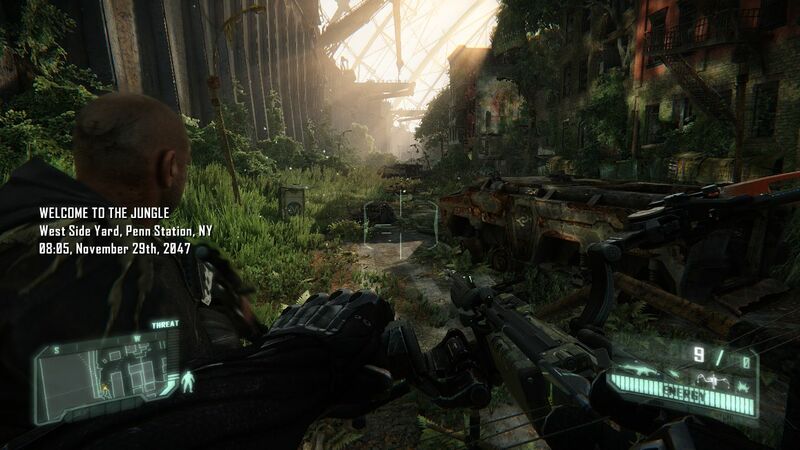 Considering the opulent visuals, Crysis 3's hardware hunger is completely reasonable. 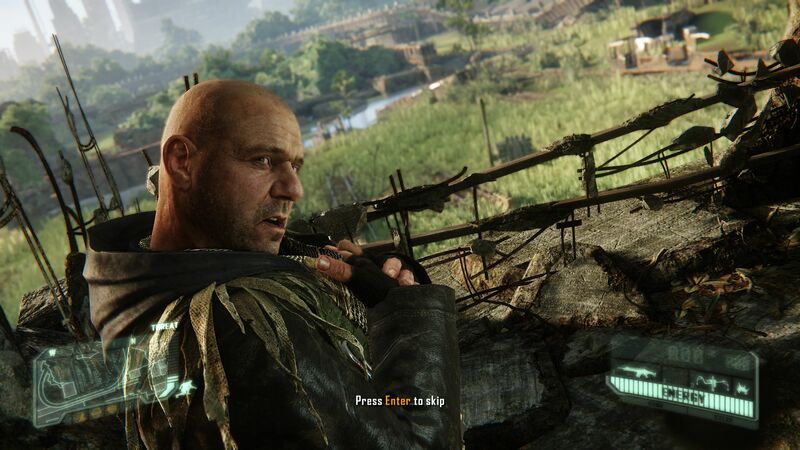 Since entry-level solutions like the HD Graphics 4000 and lower class models like the Radeon HD 7660G or the GeForce GT 630M will only manage the game at low resolutions, players will need a graphics card from the upper middle-class (for example the GeForce GT 650M or the Radeon HD 8870M) to play on medium settings. 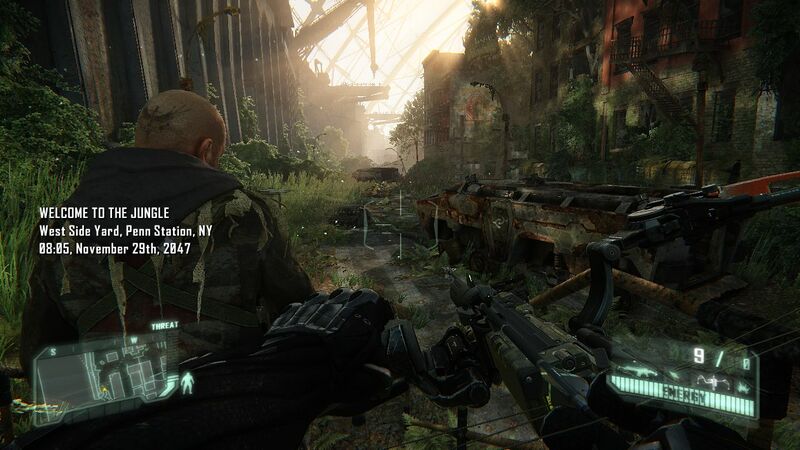 Those who want to enjoy Crysis 3 on high settings and with active anti-aliasing will need a genuinely high-end model (from the GeForce GTX 660M on up). 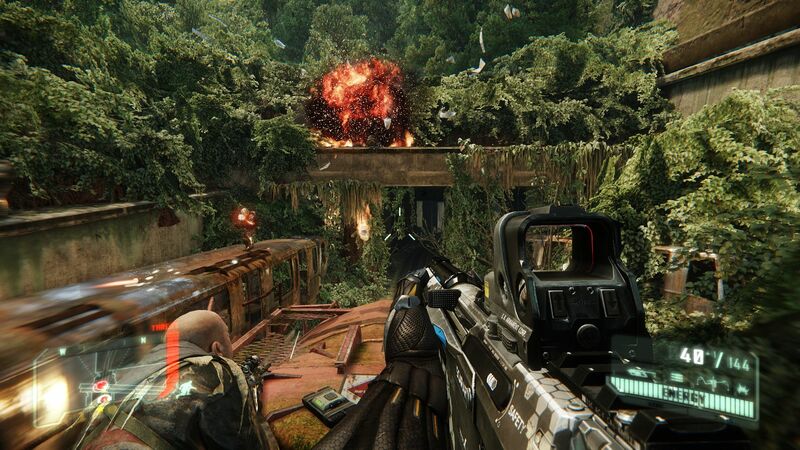 For FullHD resolutions we strongly recommend a GeForce GTX 675M or better. At a resolution of 1920 x 1080 pixels with maximum presets and anti-aliasing, all current notebook graphics cards as of early Q1 2013 are insufficient. Even the GeForce GTX 680M and the Radeon HD 7970M only reach about 20 FPS (2x SMAA) in the tested sequence. 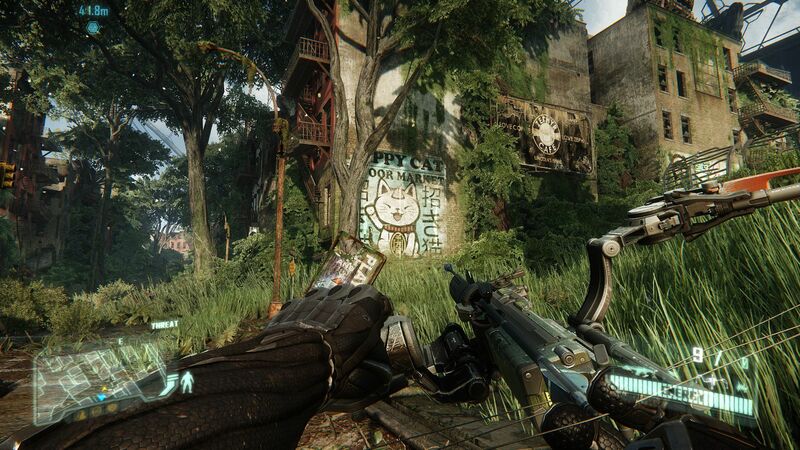 But it's important to say that Crysis 3 still looks respectable at the high or mid detail levels. 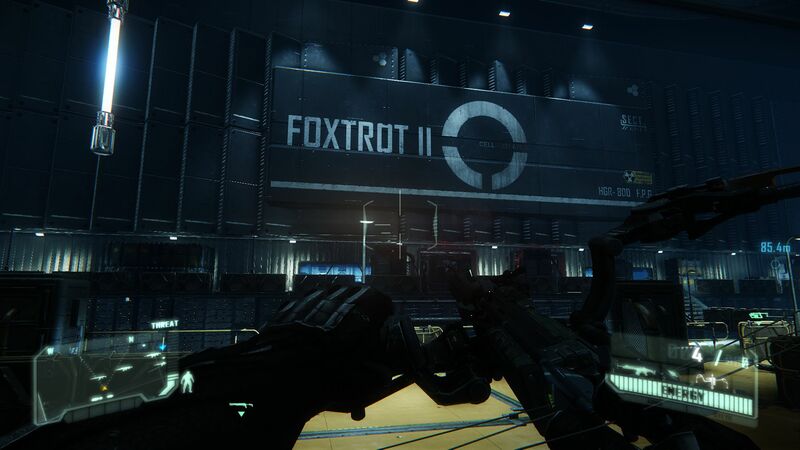 Even at the lowest graphical level the shooter can be a blast to play. 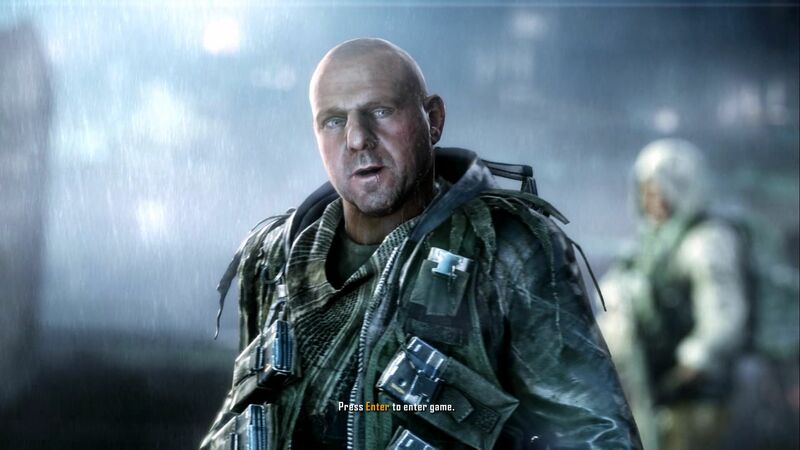 The competing Frostbite 2 Engine (Battlefield 3) falls a minimal distance behind. 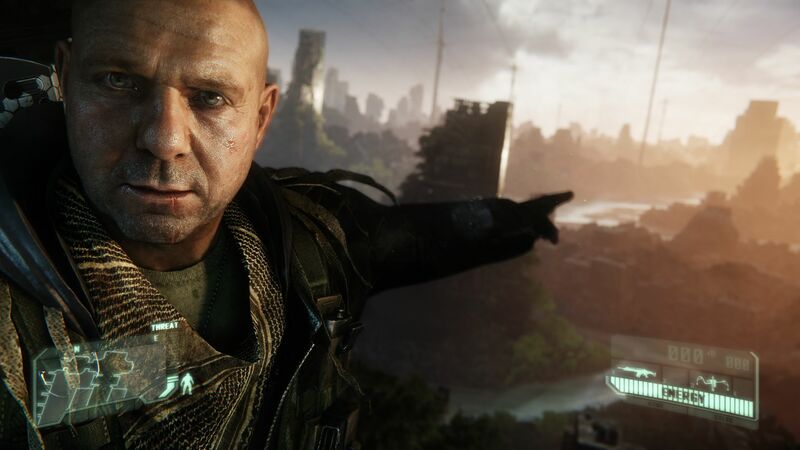 The Crytek production sprints miles ahead of the current Call of Duty title (Black Ops 2). Note: With notebooks, it is best to be very cautious with the anti-aliasing. Demanding modes like 4x or 8x MSAA will pull frame rates and the level of performance down significantly. We believe that SMAA Medium (2TX) for high-end mobile cards is a good balance point for both smooth gameplay and reducing visual jaggies. Considering nothing but the technical aspect of the game, the game is excellent on almost all levels. 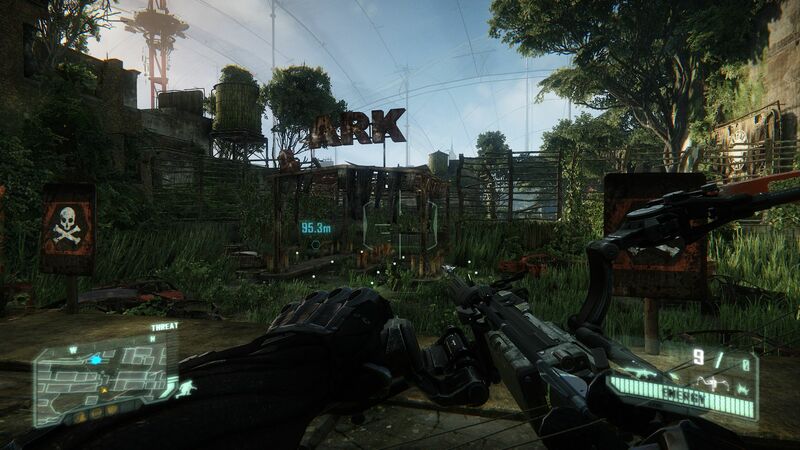 Crysis 3 shines with breathtaking visuals, which makes it clear that Crytek takes the PC platform quite seriously. In terms of gameplay, too, the title does quite well, though some will have wished for new stimuli and more spacious areas. When it comes to the storyline and plot, the shooter comes extraordinarily thin and is perhaps the title's weakest link. 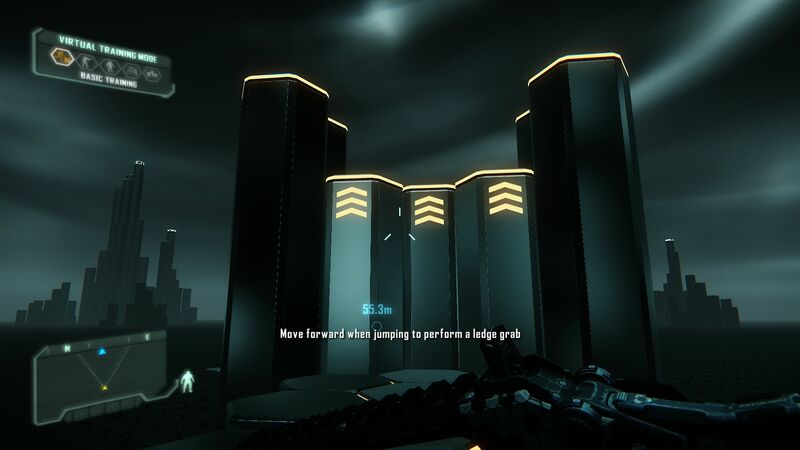 Titles like Bioshock and Borderlands 2 have raised player expectations on narrative and storytelling for modern first-person shooters. 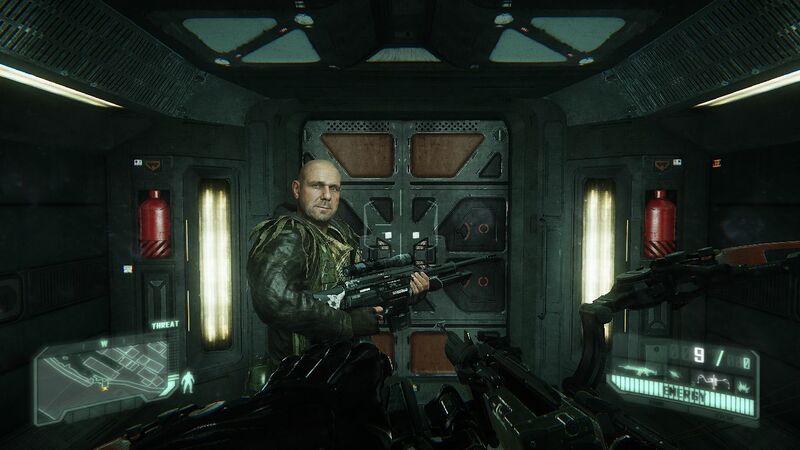 Every once in a while we get to carry alien weapons too. 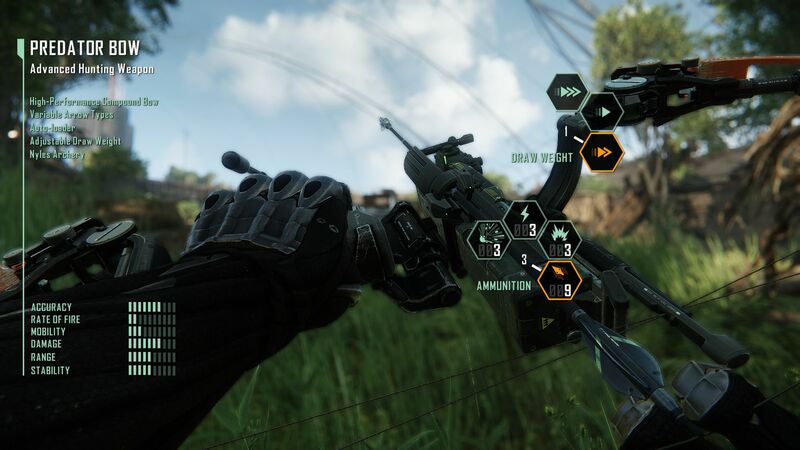 The bow-and-arrow is one of the game's greatest highlights. Without a shield things get dicey real fast. Many script sequences are a little overdone. 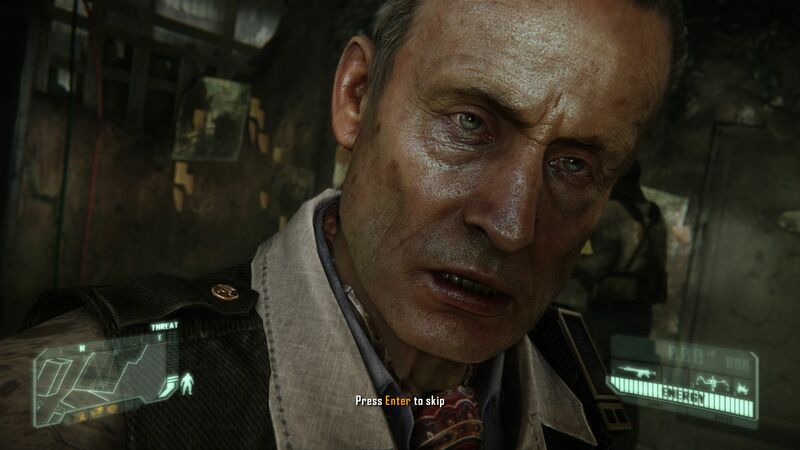 The facial animation is almost as good as in L.A. Noire. 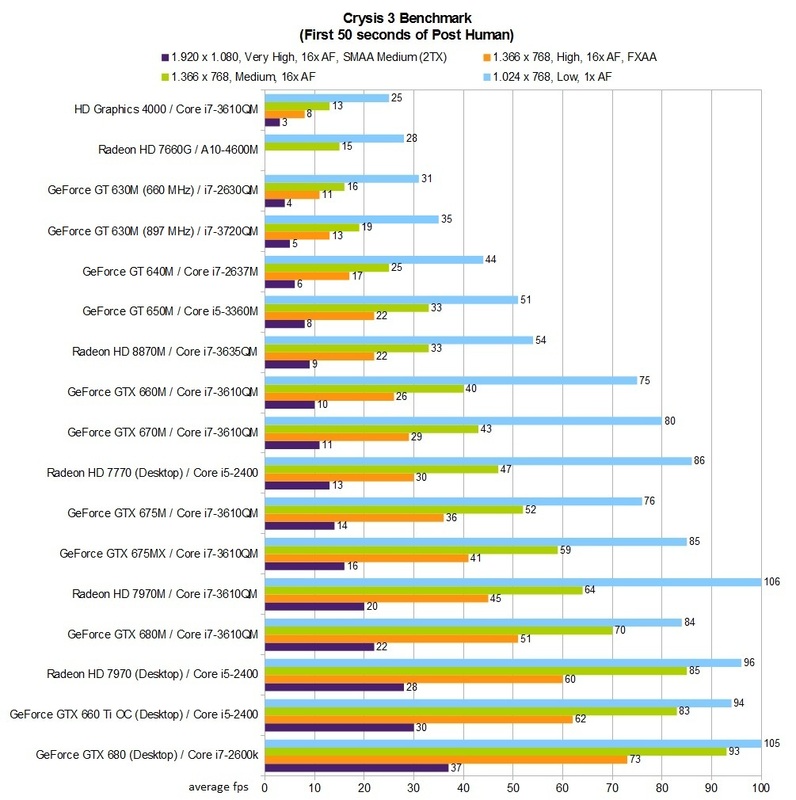 GPU driver: Nvidia 314.07, AMD 13.2 Beta 6 & Intel 9.17.10.2932.